We are a litho printers based in Bow, London E3. We have experience of all aspects of design and print, including books, stationery, postcards, menus and pamphlets, and have worked for some of our clients since we were founded in 1981. We are a workers’ co-operative initially based in Aldgate until we moved to Bow in 2015. Get in touch for a quote or to ask for advice on your ideas. 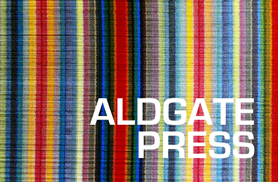 Aldgate Press were pioneers in the use of recycled papers. All our inks are vegetable oil-based. We recycle all our waste paper, plates and chemicals. We output files direct to a thermal plate, thus avoiding the use of chemicals in processing. We can help with your artwork and place your imagination and creativity within an affordable, client-friendly, budget. We are able to handle work on both Mac and Windows platforms, using the latest versions of industry-standard programs. If the world of PDFs, JPEGs and TIFFs is unfamiliar to you, we’ll give you free advice to enable you to submit your document to us without incurring extra artwork charges. Our direct to thermal plate system will output plates of various sizes and thicknesses. Most plates can be processed the same day. Call us with your specifications and we’ll give you a price per plate. We can output high quality, large format, inkjets (up to A1). Please contact us for prices.